Dozens of little feet will be at my door tonight! This week for speech we’ve been working on that social routine for ‘trick or treat’. I wanted to share some materials from Super Simple Learning that I’m loving! 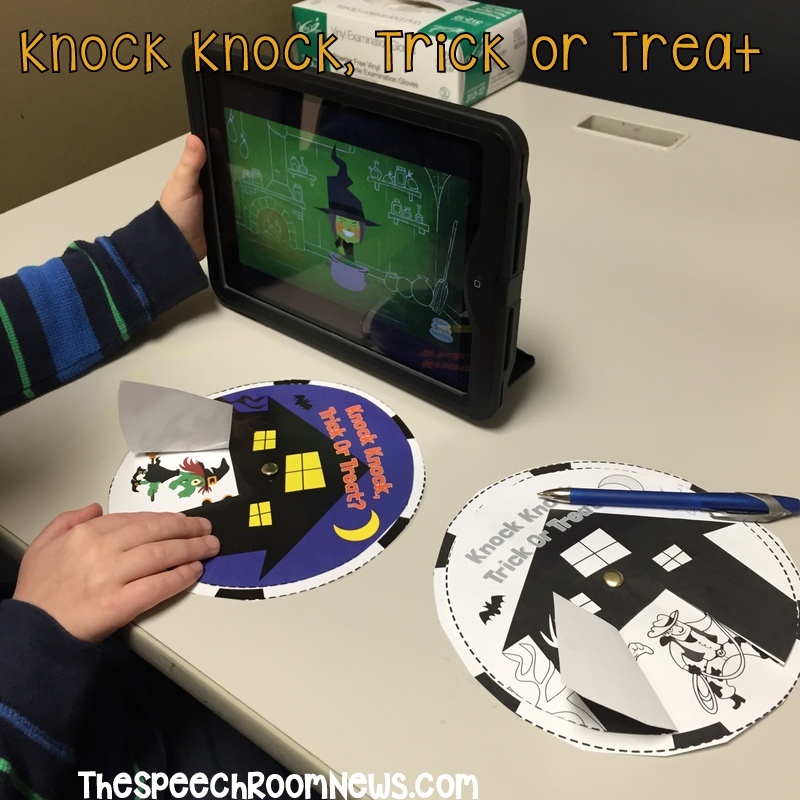 We paired this adorable song, “Knock Knock, Trick or Treat” with a spinning house craft. This little pirate guy was the favorite! The video has little break after each verse where the character dances. That was perfect for me to work on pronouncing or describing that person. 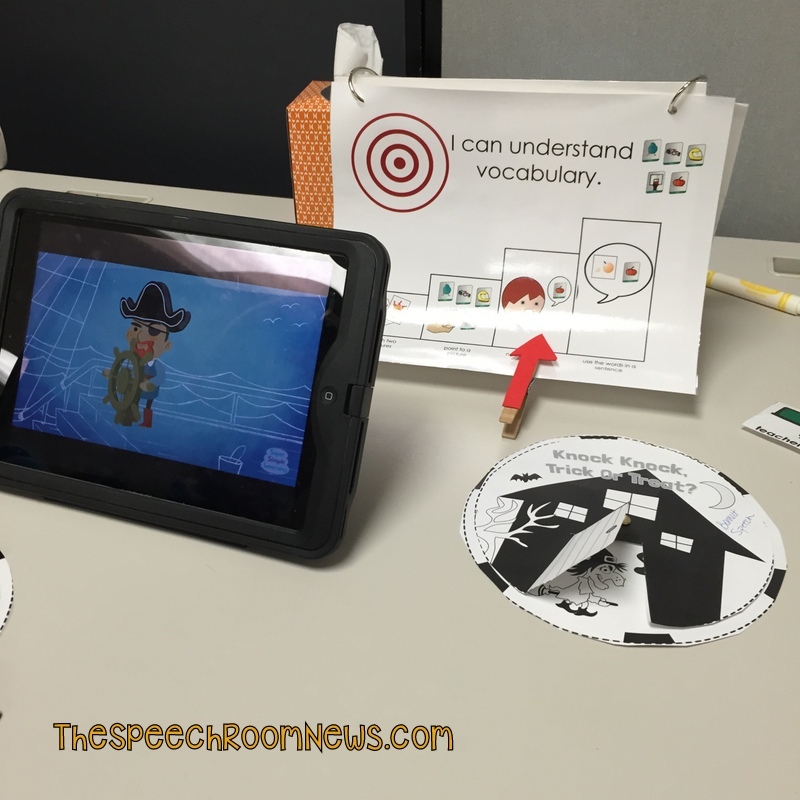 The download for the free spinning wheel is located here on Super Simple Learning. I downloaded the color version to use in speech and then sent home the black and white version for practice. How are you practicing trick or treat with your little ones? This is adorable! Thank you for telling us about this wonderful, free activity! 🙂 Quick question: Is the “I can understand vocabulary” target page an item in your TPT store? It’s something I’m using but haven’t posted yet! I will try to finish it up soon! Definitely “scratching my plans” for today and going with this! Printing the spinner now! Where did you get that “I can understand vocabulary” page? I have somehow missed that gem along the way! I haven’t shared them yet but I will do that soon! Thank you so much for sharing this. I cannot wait to use it with my PreK kids! I did not know about this great resource — thanks for doing a post about it, Jenna! It looks like a lot of fun! Are your “I Can” targets available in your TPT store? I would love something like that for my students. Thanks for your constant informative and helpful posts — you help me make learning more fun for my students!! My Preschoolers and Kindergarten students loved this activity today. Thank you so much for sharing. This is going to be so much fun with my KG students!!! I can’t wait. Thanks for sharing this! 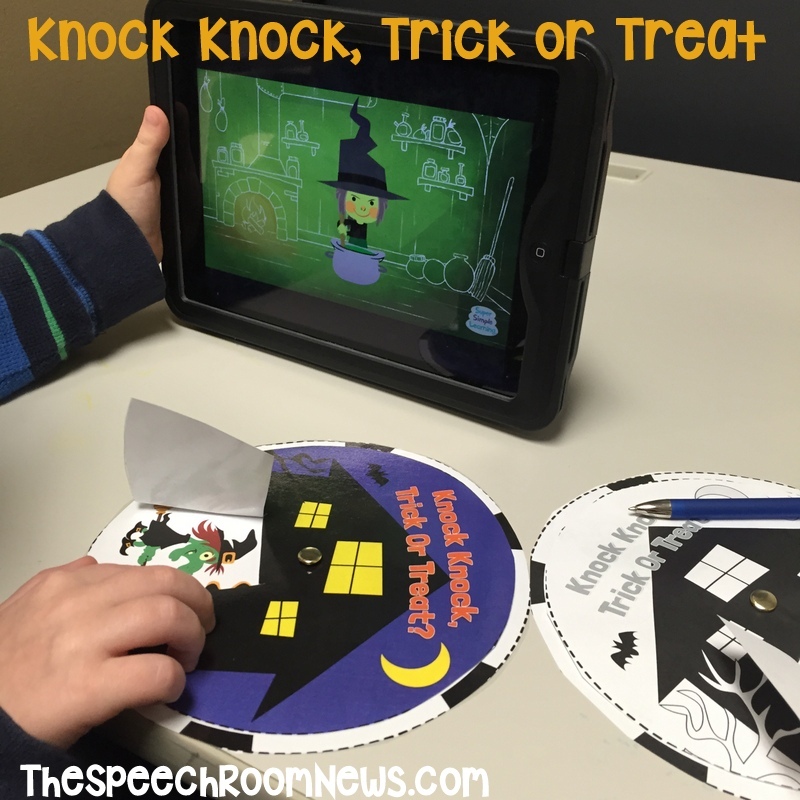 Loved how you paired these two resources from our “Knock Knock, Trick-Or-Treat?” song and used them together. What a great idea. Thank you so much for sharing. Wishing you and your students a very Happy Halloween!! P.S. The pirate is always a favorite when I sing this song too. Arrrggghhh!